Is it possible to connect a fuel line from the gas tank directly to the generator that I have added to my 23-foot Honey motorhome'? Can we do it ourselves? I've been looking for any technical help for so long. Hopefully, you are the right one. Marciano, yes yo u can tap into the existing fuel tank on your coach, however, it’s best to plumb the generator directly to the fuel take-off assembly at the top of the tank. Typically the dip tube, (that section of hose that protrudes into the tank) ends about one-quarter of the depth up from the bottom so that it will be impossible to have the generator run the tank completely empty of fuel. As a private RV owner, you can simply “tee” into the existing line going to the engine, but this practice is not recommended or endorsed. 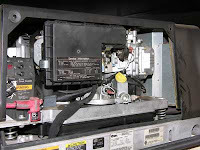 Engine starvation problems can result plus it would then be possible for the generator to run the tank empty. Most fuel take-off assemblies on RVs with a van chassis like yours will have a separate tap on the take-off assembly you can use. If not, you’ll have to obtain one from the chassis maker. But it will be necessary to drain and partially drop the existing fuel tank in order to gain access to the take-off assembly on the top of the tank. Thanks for your question; hopefully I was the right one.